Happy Summer gang, it's time to break out your favorite skincare bits for the longer days and hotter nights. And as amateur beauty editors, we know what we like, we know what feels good on our skin and we're listening. For this BC3, we wanted to show you what we've been loving in the last moments of spring. Give your skin some lovin'. And let's get this straight, this serum is a straight up miracle worker. Jam packed with 22 varying botanicals, our skin is gulping down this product. Made from the world’s most nutrient rich botanicals and essential oils, it is a skincare game changer that restores skin’s balance, texture and natural radiance. The overall evenness of our skin has become more apparent with use of this every other night. We use four to five drops in the palm of the hand and press firmly into the cheeks, chin, forehead, and temples. // vintnersdaughter.com; 30ml $185, 5ml $65. 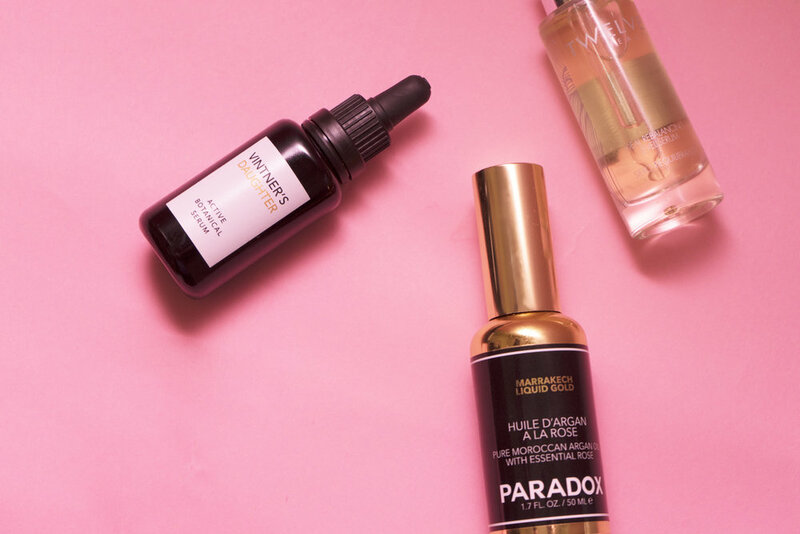 Because who isn't looking for a perfect rose argan oil? Paradox hits the nail on the head. This lightweight formula is quick absorbing, doesn't leave a greasy finish and is surprisingly multiple purposes. Whether you mix it in to an existing moisturizer, layer as a 15-minute mask, or even scrunch into wet hair—we feel a deep moisture sinking in. We recommend doing a mask (either skin or hair application) with Paradox once a week or for extreme treatment, twice a week. // shopparadox.com; 50ml $65. For the days where we need a good cleanse and foundation, we reach for Twelve Beauty's answer to green beauty. This serum is incredibly lightweight on the skin, the texture of water—no greasy film or texture that puts pressure or fills the pores. This serum is like giving your skin a full glass of water. Ideal for oily, combination and younger skin, it can help to rebalance and hydrate, whilst reducing pore size. For us, it improved the overall appearance of our combination skin. This produce is better applied with light finger taps and light massage. // twelvebeauty.com; $68 30ml.